More than 1 billion people on earth don’t have enough food to lead healthy lives, including one in six Americans, said Kids Care regional manager Matthew Martin. “I will spend rest of my life and all the breath God gave me packaging meals,” Martin, former pastor of Faith Lutheran Church in Quincy, said. 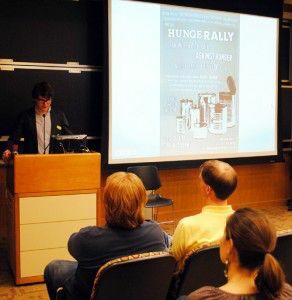 Martin joined about 50 Boston locals and college students at Boston University’s College of Arts and Sciences Saturday for the interfaith dialogue “HUNGERally,” a series of speeches aimed at raising awareness about hunger relief and homelessness in Boston. The dialogue, co-organized by BU Interfaith Council President Abigail Clauhs, involved the Values in Action at the Humanist Chaplaincy at Harvard University and students from Massachusetts Institute of Technology, Brandeis College, Fisher College, Tufts University, Boston College and Gordon College. “We’re in a city with so many colleges that it just makes sense to involve the different communities from so many different colleges all together,” Clauhs, a CAS sophomore, said. Members of soup kitchens and representatives from different faiths joined students in debating hunger issues on a global, national and local level, as well as different measures college students could take to address the problem. Students of various religious and philosophical backgrounds shared stories, excerpts from religious texts and poetry. “In most religions, there is this idea of helping others and especially feeding the hungry because there’s that parallel between that hunger of the physical kind and the spiritual kind,” Clauhs said. Mike Bancewicz, and administrator of the Church on the Hill, said the people he serves are not solely the homeless. “We see a lot of foreign students who have no family here and are too embarrassed to tell their fellow students they’re hungry,” Bancewicz said. The organizers told students to tweet and make Facebook posts throughout the event to bring awareness about hunger and inspire others to take action. Beth Frickey, a College of General Studies freshman, said she was pleased everyone could come together for the sake of rallying against hunger. “It was heartening to see how people from different backgrounds come together and fight for the same thing,” Frickey said. School of Education sophomore Jessica McBride said she attended the event to follow in the steps of her savior. A number of students, including Boston College graduate student Emily McHugh, said there should be more interfaith dialogues and future service projects. “If we could get this many people for an interfaith event, we could definitely get people for a service,” she said. Clauhs said she hopes for the interfaith dialogues to continue enlightening students about how to combat hunger and poverty in their communities.